My husband, Nick, and I traveled to Morocco for our honeymoon. We spent two weeks traveling all around the country in July-August of 2006. During our two weeks in Morocco, we spent time in cities and small towns as well as in the mountains, the desert, and by the seaside. We traveled by plane, train, automobile, and camel! We knew that this was the trip of a lifetime and we wanted to see as much of Morocco as we could while we were there—it was a whirlwind tour. We had an amazing time and have incredible memories of our Moroccan honeymoon. Both Nick and I had traveled extensively before we were married. We decided that for our honeymoon, we wanted to go somewhere that neither of us had ever been before, so this narrowed our choices down significantly. We also decided that we wanted to celebrate our marriage with a momentous trip, to a destination that we had been dreaming about for years. Being adventurous travelers, we knew that just lounging on a beach somewhere wouldn’t be enough for us. We set out to make incredible honeymoon memories and we definitely succeeded! Although we agreed on what kind of a honeymoon we wanted, it was much more difficult to decide on a destination. We talked about Costa Rica, New Zealand, Central America, South Africa… but couldn’t make a decision. The entire time, we both had a thought in the back of our minds… Morocco. We had both dreamt of traveling to Morocco for a long time, drawn by thoughts and images of exotic spices, beautiful handicrafts, colorful architecture and hospitable people. Nick dreamed of riding camels in the desert. I dreamed of exploring ancient kasbah (fortress) ruins and green oases. However, we weren’t sure that Morocco was the right decision. We worried that the desert area would be too hot during the summer, or that we wouldn’t have enough time to do the diverse country justice in just two weeks. But as we considered destination after destination, we kept coming back to our dream of seeing Morocco together. Finally, we agreed—Morocco was our dream destination and would make a perfect honeymoon. Once we had made the decision, we both knew it was the right one, and we dove into planning the details of the trip right away. Deciding where to go and where to stay while in Morocco involved a lot of intense research. We got lots of ideas from guidebooks and internet travel sites, even chatting with fellow travelers on online chat sites. We spoke with the few people we know who had been to Morocco, to find out what they thought were the “must-sees” in the country. For a while, it seemed like we would need months to see everything we wanted to see in Morocco! It was difficult to narrow down our itinerary, but we had to make it work in the two weeks that we had. While we wanted to see as much as possible, we also knew we would need time to relax and enjoy our first trip as a married couple as well. We were still narrowing down our choices and making hotel reservations up until the day we left for the trip. Thankfully, all of the details fell into place and we ended up with a fantastic plan to see as much of Morocco as we possibly could. During our two weeks in Morocco, we traveled to many different places and stayed in a variety of hotels. We flew into Marrakech, in the middle of the country. Marrakech is known for its lively markets that come alive at night with locals telling stories, eating at open-air stalls, and selling everything you can imagine. 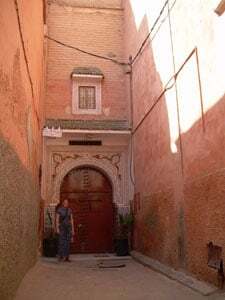 We explored the narrow alleys of this ancient walled city for three days, reveling in the sensory overload and getting used to the heat of Northern Africa. While in Marrakech we stayed at a traditional riad, which is a converted traditional home that is built around an open-air courtyard. It was an incredible relief to leave the dusty, busy streets behind each evening and relax in our secluded, quiet riad, the Riad Meriem. From the first moment we arrived, we knew we had found a hidden gem. After three days in Marrakech, we left the big city for its smaller sister, Fez. Fez is known as the city of artisans, as it is home to many workshops of artists producing traditional Moroccan handicrafts such as tile mosaics, ceramics, wood carving, etc. We spent two days exploring this town and made the great decision to hire a guide the first day—we would have gotten horribly lost without him! He led us on foot through the narrow streets of the medina (old town) which has been designated as a World Heritage site by UNESCO. While in Fez we stayed at another beautiful riad, the Riad Norma. All of the riads we stayed at were small and intimate and it was easy to feel right at home. We took advantage of the pool and enjoyed incredible food at the Riad Norma. After our two days in Fez, we met up with a driver who would take us on the next leg of our journey, into the Moroccan countryside. We had made arrangements in advance to hire a driver because it is the best way to get off the beaten path and see parts of the country that few tourists get to experience. We drove out of the city and into the Atlas highlands, traveling through cedar forests, looking out the window at the monkeys that live there. Beyond the forests, we found ourselves heading into the Moroccan desert. Incredible scenery surrounded us: deep gorges, wide horizons, imposing cliffs. This was the Morocco we had come to see! Before the end of the day, we were out beyond the end of the paved road, heading towards the dunes of the Sahara. We stayed at a small hotel on the edge of the desert, and considering the sweltering heat, the hotel staff made a bed for us on the roof, where we fell asleep under the stars. The next morning we were woken up before dawn to go on a camel ride into the desert and watch the sun rise among the dunes. We couldn’t stay long in the desert, so we drove out of the dunes and headed back West into the heart of Morocco. We spent the next night in a small town, Ourzazate, which is known for the ruined kasbah that towers over the town and for appearing as a movie set in various Hollywood films, including The Gladiator. We stayed at a sprawling but comfortable hotel with much-appreciated air conditioning, Hotel Ait Benhaddou. We awoke early the next day to climb up the hill of the fortress, and were rewarded with spectacular views over the wide green valley, stretching like a jeweled snake through the desert. We didn’t linger in Ourzazate either, but instead headed out on the next leg of our trip which would bring us high into the Atlas mountains. Our driver navigated narrow mountain passes and sharp hairpin turns—for a time it felt like we were on a journey to nowhere. But eventually, we arrived in a tiny mountain hamlet, where we were met by messengers from the hotel that would be our next stop: Kasbah du Toubkhal. The messengers led us by donkey up a steep mountain path to the hotel, built on the site of a former fortress. This beautiful mountain retreat would be our home for four relaxing days while we enjoyed views of the highest mountains in North Africa, ate delicious Moroccan food, and simply relaxed for the first time on our trip. It was a beautiful place to spend our time and the hospitality of the staff was impeccable. It was difficult to tear ourselves away when our four days were over, but we had more destinations to explore. Leaving the mountains, we headed west towards the coast. After glimpsing the sea, we turned north and inland again to follow the road to Paradise Valley, a secluded gorge filled with palm trees and waterfalls. Because it was the dead of summer, the usual expanse of green was dried out and dusty, but the views of the valley were impressive nonetheless. We spent the night at Hotel des Cascades, a simple but comfortable hotel in a small town at the top of the valley. While eating dinner on the terrace, we looked out over the valley and a spectacular sunset below. The next day we continued our journey towards our last stop in Morocco. We left our hotel and followed the Paradise Valley back towards the coast and our final destination in Morocco, a small fishing village named Essaouira. This quaint village is marked by whitewashed houses with every door and shutter painted bright blue to mirror the ocean. The cool breezes off the water were a welcome change from the dry heat of the rest of the country. We stayed at the Emeraude Hotel, a quiet and comfortable place hidden on a side street away from the busy market. We enjoyed breakfasts on the colorful rooftop terrace every morning while looking out over the town. The town itself was easy to explore and we found some great food and good music. The relaxed, seaside atmosphere was a great way to end our whirlwind trip through the beautiful and energetic country of Morocco. We did so many memorable things during our honeymoon in Morocco that it’s difficult to pinpoint just a few that were the most special! One highlight was the morning in the desert when we awoke before dawn to ride camels out into the dunes, to watch the sunrise over the Sahara. It felt like Nick and I were the only human beings in the world, as our camel guide led us out into the dunes and then let us go explore on our own. That is an experience that we will never forget. Besides this memorable moment, we enjoyed exploring and getting (almost) lost in the maze of narrow streets in the markets of Marrkech, walking on the top of the city walls beside the sea in Essaouira, and relaxing in the shadow of the tallest mountain in North Africa. All of these experiences were eye-opening and interesting, and it was so meaningful for us to be exploring a new and different part of the world as a newly married couple. Our adventures in Morocco are just a small part of the lifelong journey that we have started as husband and wife. 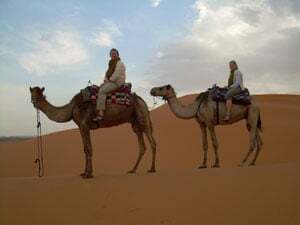 I would recommend Morocco as a honeymoon destination to other people who are experienced travelers looking for a memorable adventure to start your married life. We knew that it would be a challenging and memorable trip and we were not disappointed. 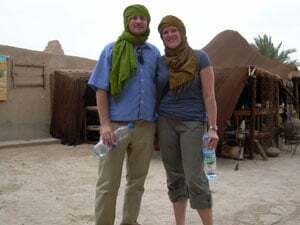 That said, Morocco is not always an easy place to travel—both my husband and I have traveled extensively in the past and we are used to the small hiccups that you sometimes encounter while traveling off the beaten path. In fact, those unexpected situations are usually part of the fun and excitement of traveling! I would advise anyone looking for an adventurous and unique honeymoon to consider Morocco.